Tsipras: "There are no victors or vanquished. It is a victory for all of us. Democracy cannot be blackmailed. We have all won." Upsum. There is no Greek default. No Grexit. 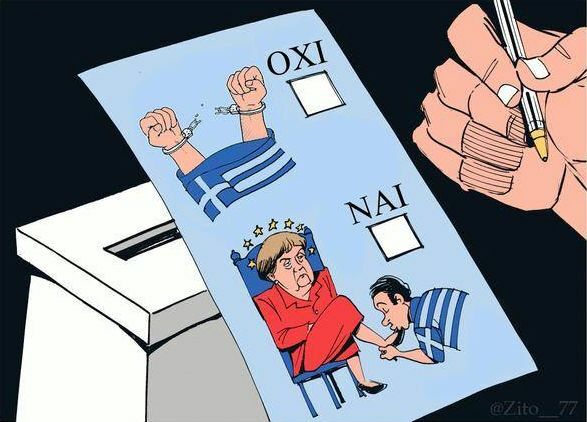 The Greeks voted for Europe, against austerity. Liquidity critical. ECB has to make next move. The threats and intimidation by the EU failed. Greeks overcame fear, did not capitulate under economic terrorism. Had Alexis Tsipras and Yanis Varoufakis signed what EU tried to force them to sign, it would have been more soul destroying austerity for Greece. Alexis Tsipras and Yanis Varoufakis have said, enter into fair discussions, reschedule debt in order that it will be paid back, but what we will not do, is punish the poor of this country. Lies and propaganda the mainstream media helped spread, but it was countered by social media, this blog for a week countered the lies and propaganda. What would the day bring? Last night in the centre of Athens singing of Bella ciao, an Italian partisan song that originated during the Italian civil war (a conflict which led to the death of Benito Mussolini and to the collapse of the Fascist regime in Italy). It is sung worldwide as an anthem of freedom and resistance. Early afternoon, a friend in Athens told me all her tutors, all her friends had voted no. There was hope. Alexis Tsipras called a referendum. He was attacked by the EU for doing so. It is called democracy. He said the terms on the table were not acceptable, he asked for a mandate from the Greek people. The Greek people have responded with a resounding NO, the terms from the EU were unacceptable. Even those who voted YES, they do not support austerity or the EU, but they were fearful of even worse to come, the wrath of the EU being brought down upon Greece for daring to oppose the wishes of the EU. And we have already heard threats that Greece will be kicked out of the euro kicked out of the EU. The usual garbage from The Sun, Greece descends into anarchy. Athens tonight, joy on the streets. But it will not be an easy ride. The full wrath of the EU will be brought down upon the Greek people. Tis dikaiosynis ilie noite is composed by the legendary Mikis Theodorakis and its lyrics are taken from a poem written in 1949 by Odysseas Elytis. Dramatic, inspirational and optimistic, it has became a symbol of Greece healing it’s wounds. The song became a hymn for the Greeks after the establishment of democracy in 1974 — a song representing their desire for freedom and progress. We must all show solidarity with the Greek people. Whatever the result, oxi has won. In one dramatic week, like the referendum debate in Scotland, it has engaged people, the genie is out of the bottle, there is no going back. The flame of hope burns bright tonight in Athens. We must not let EU cruelly extinguish this flame, as try they will. Like the Olympic Flame, it must be carried across Europe setting other flames of hope alight. What can we do to help the Greeks? Georgia with Adultery, latest book from Paulo Coelho. Synchronicity: I was reading Adultery this afternoon. The story revolves around Laura, a journalist who has lost meaning in her life. She reads Porcupines and Solidarity to her children. If Paulo Coelho’s latest book was on display, I could not see. I asked at the counter. They did not know, and I was asked for the title. I was taken to where it was spine showing not cover, with new titles. They said they had sold a few. I would assume, people in the know, as not on prominent display. I would have expected a bookshop to know of an international best seller from an international best selling author, but they did not. 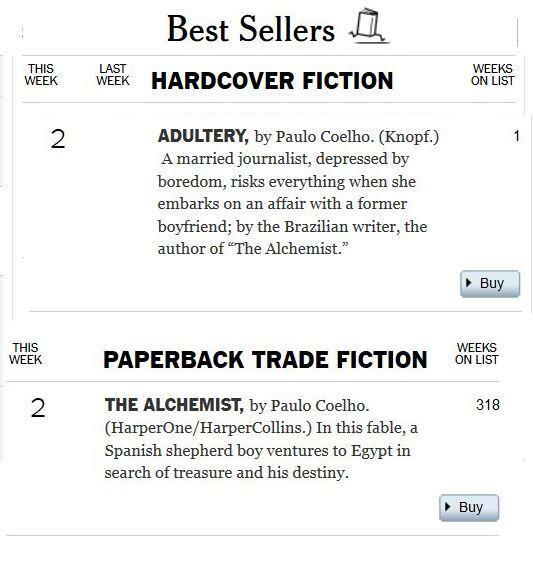 Last Sunday, Adultery entered the New York Time’s best seller list at No2. The Alchemist was at No2 in the charts for paperbacks. Sunday, Paulo Coelho is a guest of Oprah Winfrey on Super Soul Sunday. Looking in Morrisons last week, I noticed Police, latest book from Jo Nesbo was half price. If same offer in WHSmith, with 20% off voucher, then an even better deal. 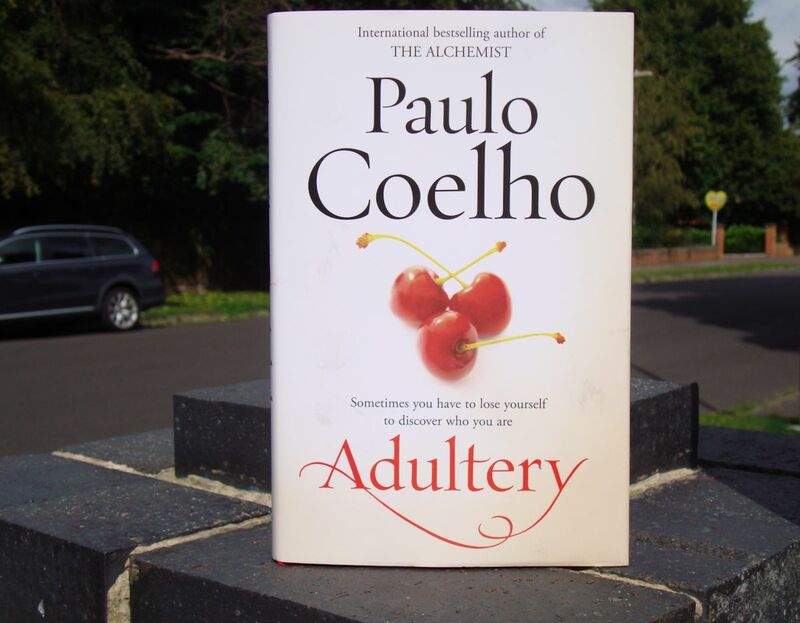 I checked WHSmith Guildford last week on a fruitless search for Adultery, latest book from Paulo Coelho, on offer in WHSmith only you cannot find it, if they did have it and sold it, they do not restock. Where I had a bizarre conversation with thick-as-two-short-planks deputy manger who tried to tell me it was only ‘opinion’ Adultery an international best seller. WHSmith Guildford, Police buy one get one half price. Not such a good deal. It was therefore a surprise to see on Monday, Police still at half price in WHSmith Aldershot. I looked in again today. A chart of paperbacks, Police that was at No1, now not shown in the charts. It could not have dropped out within the space of a week. I looked around, found a second chart of paperbacks, where it was still shown at No1, and had a half price stickers. At least one had a half price sticker, the others had no stickers. I also noticed, where shelved, buy one get one £1-99 (or something similar). To be on the safe side, I took the one with the half price sticker to the counter. Yes, it was half price, and yes, the second £1-99. I got a further 20% off with 20% off voucher. This time I was given a get £5 off if you spend £15 voucher. Better even than a 20% off voucher if you spend £15, as getting third off, ie 33% off. I queried, why was it shown buy one get one half price in WHSmith Guildford, to be told different stores had different prices. I then asked did they have Paulo Coelho’s latest book? I had looked Monday, and not found where previously two copies had been randomly shelved. No, they had not restocked when they sold their two copies when Adultery was published mid-August. Unbelievable, an international best seller, from an international best selling author, Adultery entered New York Times best-seller last last Sunday at No2. This Sunday, Paulo Coelho a guest of Oprah Winfrey on Super Soul Sunday, first part of a two-part interview. An international best-seller that was on special offer in WHSmith (though no longer), that was not on display, those stores that had when they sold their copies, failed to restock. Police, half price in some WHSmith stores, but not all. WHSith on-line, a higher price than in-store. Jamie’s Comfort Food is on display at half price in WHSmith. It can be bought cheaper in Sainsbury’s. I buy books, I was buying books. It was made very clear to me the store was closed, and I was politely asked to leave. It is little wonder WHSmith a failing High Street chain. The only surprise is that they remain in businesses. WHSmith would make a classic case study in a businesses school on how not to. 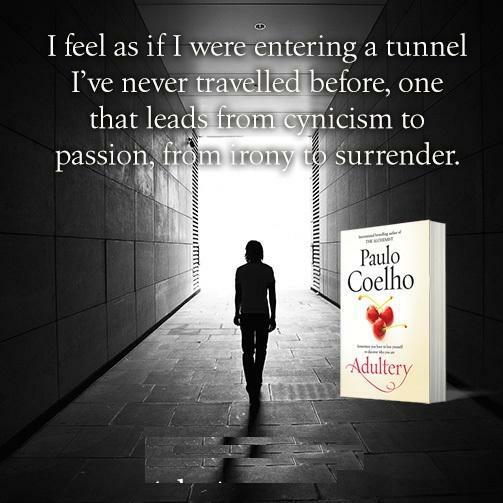 Adultery I feel as if I were entering a tunnel I’ve never travelled before, one that leads from cynicism to passion, from irony to surrender. After my appalling experience in WHSmith Guildford, I look in Waterstone’s Guildford, do they have Paulo Coelho’s latest book? I cannot see with new releases. I ask a very helpful young lady with flowers in her hair. She says yes, they have, and takes me to a display table, where I had not thought to look. None there. A colleague tells her all sold, more have come in. She tells me it is selling well, four sold that week, and seven more have just been delivered. She also tells me she had started reading Adultery and it was very good. She offers to go and unpack a copy for me, it will only take a few minutes, if I do not mind waiting. I say no, I am literally starving, and must go off and get some lunch. I tell her of my appalling experience in WHSmith Guildford and thank her for being so helpful. I had looked in Waterstone’s Guildford prior to publication of Adultery, and told a member of staff I knew that it was an international best-seller. Heed must have been taken, as she said she would pass it on. Contrast with WHSmith, an international best-seller, on special offer, and yet they do not bother to stock, if they do not on prominent display, and if they sell their only copies, they do not restock. Adultery Will I survive? Of course I will I’ve survived storms before. Each time I think, it cannot get any worse at WHSmith, they prove me wrong. WHSmith Guildford, would they have Paulo Coelho’s latest book? I negotiate all the obstacles and obstructions between the entrance and the escalator, and go up to the first floor. I look in all the obvious places, latest releases, special offers. I draw a blank. Nada. I seek help from a member of staff. She actually knows what I am after, or another member of staff does, I am taken to where it is seemingly randomly filed. All of one copy. She pulls it out and hands it to me. Noticing the absence of a half price sticker, I ask is it still on special offer? I am told no, the offer has ended. Thinking this cannot be, it only was published a couple of weeks ago, I take the book to another member of staff. He scans the book and confirms what I have been told. A single copy of Adultery, and no longer on special offer. This beggars belief, a best-seller on special offer, nowhere has it in stock, then when I find a store that has a copy, a single copy it no longer is on offer. I ask for the manager. Floor manager? No, store manager. No manager to be found, I settle for deputy manager. A bizarre conversation then ensues. I am told I should have come to this store not other stores where they did not have a copy. I am then told it does not sell, and it is my opinion that it is a best-seller! Jamie’s Comfort Food, latest cookbook from Jamie Oliver. Displayed in the window, on special offer at price half price, on display in-store. At half price, better off walking across the road to Waterstone’s, where at least they know about books. Or if you want it less than half price, walk up the High Street to Sainsbury’s, where it is £12-99 (same price as Amazon). I walk out of the store in disgust. Fact: Second print run in US in less than a week. Fact: In Sunday Times best-seller list. It is unbelievable anyone can conduct business in this slapdash manner and still remain in business. WHSmith has become a laughing stock. But I doubt they even care. Adultery, published earlier this month, an international best-seller from an international best selling author, WHSmith has it on special offer at half price, or it was, but either not in stock, or where they have sold, have not bothered to restock, then when found, no longer on special offer! If you have an international best-seller on special offer, do you not have it on prominent display? Just when I think WHSmith can not get any worse (WHSmith Lincoln, WHSmith Camberley, WHSmith Farnham), WHSmith Farnborough once again proves me wrong. Did they have Paulo Coelho’s latest book? I look in all the obvious places, latest releases, special offers, even where it had been randomly filed over a week ago. I draw a blank. Nada. A member of staff sees me looking lost, and offers to help. Now there is a rarity, a helpful member of staff. I say what I am looking for, he does not know, and goes off to ask another member of staff. He returns with the answer, we had two copies, we sold them. Now I think it fair to say, Adultery, Paulo Coelho’s latest book is not a rare limited edition. It is an international best-seller, last week in the Sunday Times best-seller list, WHSmith Farnborough sells their only two copies, but fails to re-order. A best-seller they have on special offer, only they do not bother to stock! Adultery, published earlier this month, an international best-seller from an international best selling author, WHSmith has it on special offer at half price, they have failed to restock the copies sold, let alone on prominent display!